Delvin Breaux appears to be set to sign south of the border. According to ESPN's Adam Schefter, the former Hamilton Tiger-Cats cornerback reached an agreement to sign with the New Orleans Saints on Saturday. 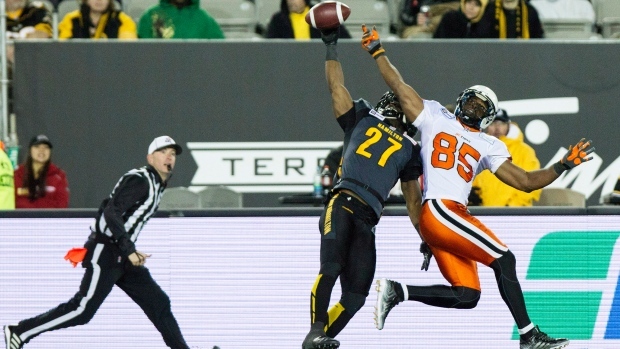 Breaux was released by the Tiger-Cats earlier Saturday to pursue his NFL opportunities. He worked out 13 NFL teams prior to agreeing to a deal with the Saints. The 25-year-old cannot formally sign until February. Breaux was a CFL All-Star in 2014. The move completes an unlikely comeback for the Louisana native, who suffered a traumatic injury as a highly-sought recruit in high school. At 17, he broke his C4, C5, C6 vertebrae and suffered a partially blocked artery due a chopped bone after making a hit while covering a punt in a game between his McDonogh 35 High School and Jesuit High in New Orleans. Breaux's doctor told him the injury should have killed him. Eight years later, after two CFL seasons, Breaux is now an NFL player. Files from the Canadian Press were used in this report.